The Pollock, a member of the cod family, is scientifically known as Pollachius Virens. It’s distinguished by several features that set it apart from the rest of the cod family. Possessing a lower jaw that projects beyond the upper jaw, the pollock also has a forked tail that differs from the straight ones on the rest of the species. The lateral line that runs along the sides of their body is straight, unlike the curved lines on other cod. Their bodies are greenish brown or olive green, varying along the top, with yellowish green and gray flanks. They are often called green cod or coalfish because of their coloration. Pollock can be found primarily in the Atlantic Ocean. They range from Iceland to northern Spain, with some populations found in the English Channel, western Baltic and the North Sea. It is said to be the most active member of the cod family, with most anglers finding them around Cape Cod, or along the U.S. eastern coast. Living in waters shallower than most of their relatives, they can be found at depths of 100 fathoms, with some living near the shore. Younger Pollock travel in small schools, usually found near the surface. These juveniles have a slightly different jaw than the adults, but that will fade as they mature. Pollock are considered daytime sight feeders. The young eat microscopic crustaceans, such as copepods, while the adult Pollock feed on larger crustaceans such as shrimp. Well equipped for hunting, they are strong swimmers, and are extremely capable of outrunning their prey. Poolock can be readily caught on artificial plugs, jigs, bait, etc. Pollock are particularly active around breakwaters and other structures during moving tides. This, along with early morning or evening fishing, usually spells success for the fisherman. 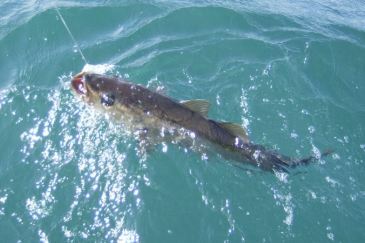 Pollock are fished for mainly by bait or jig fishing. They respond well to shrimp, herring, squid, clams, worms, jigs, spoons, tube lures, spinners and plugs. They are a relatively abundant fish, and once they are caught, they put up a fight, of course, but probably stay in the water more than most anglers like. Pollock are bled, gutted and iced immediately after being caught to maintain their excellent taste. If they are iced in a large cooler, the melted water should be drained occasionally so the fish do not soak in warming water. This will cause them to sour quickly. If they are iced in a boat fish box, the angler should remove the fish box's drain plug and replenish the water supply regularly. They are best eaten right after they are caught to preserve freshness.